Both Target and Walmart have done a bang-up job of having excellent store exclusives for the ongoing G.I. Joe - Rise of Cobra line. 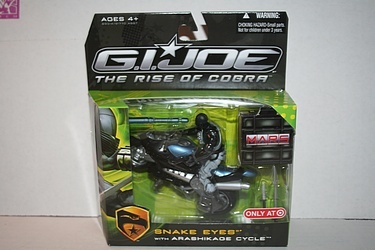 We keep the archive growing with today's addition of Snake Eyes on his Arashikage Cycle. Wave 2 of these exclusive figure/vehicle packs also sees Storm Shadow on his white bike, so be sure to keep an eye out for that more elusive figure.